I'm back from the first day of Stitches West! My friend Cathy and I spent four hours in the marketplace looking at yarn and patterns and stitch markers and project bags and so much more. It was wonderful and crowded and overwhelming, as it is every year. On the drive there, Cathy and I agreed that we didn't want to blow spend as much money as we did last year, so we devised a plan to help each other out. 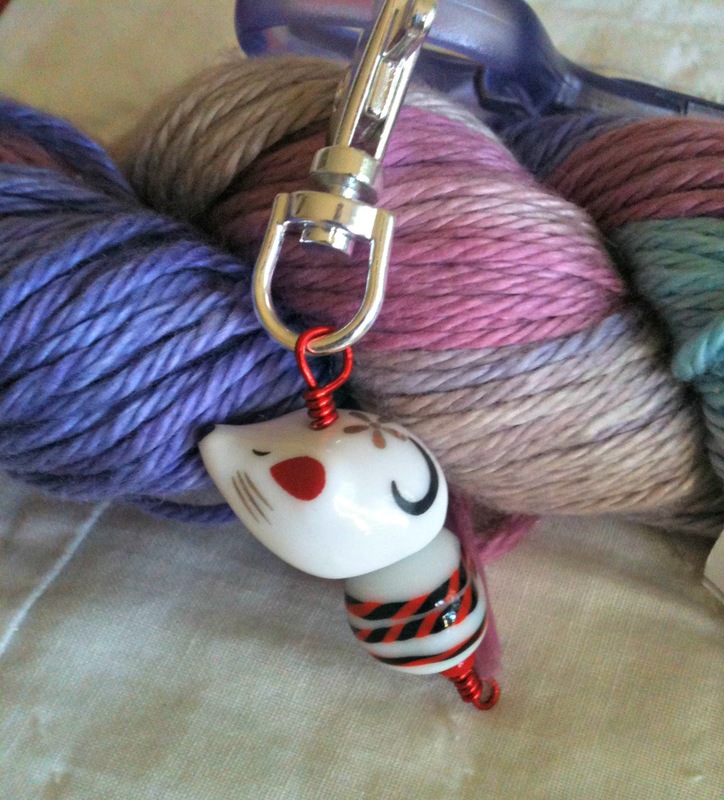 Whenever she saw me losing my willpower, like when I almost bought twenty blown-glass stitch markers, she sang to me, "Money, money, money" from the Abba song of the same name. (Here is Meryl Streep singing it in Mama Mia!) I did the same for her, and it worked! 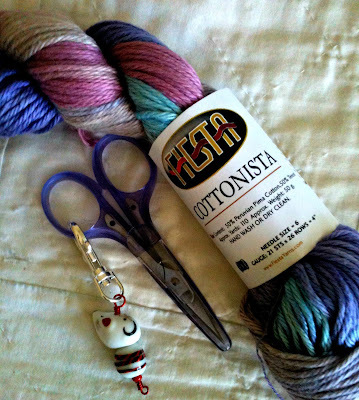 I only bought one lonely skein of Fiesta Yarn Cottonista, two Lo-Lo Bars (gifts for friends) and a pair of scissors with a cute fob. Cathy did even better-- she bought nothing. The true test for me will be tomorrow when I go back alone for a morning class. I can't not stop in at the marketplace, and those little glass stitch markers might prove to be too cute to pass up without my singing buddy. Thank you for all the kitty love and support when Apollo was sick a few weeks ago. He is doing great now-- eating, drinking, and finally back to wrestling with his brother. It's so good to see him healthy again. Please don't ever get sick like that again, Apollo. In addition to attending Stitches and the recovery of my kitty's health, there is one other special event going on this week. I was selected as the Knitting & Crochet Superstar on the crafty website Cut Out & Keep, and they are featuring one of my existing patterns every day this week as well as an interview with me. If you have a moment, please check it out! Oh, but I must confess that the photo of me is outdated-- not long after it was taken I started putting on the pounds and stopped letting people take my photo. Anyway, a big thanks to Cat Morley at Cut Out & Keep for featuring my blog! good thing I don't knit..those markers are adorable...can you wear them as a necklace? Glad to hear Apollo is feeling better! My AbbyDog was under the weather last week, poor thing. Just wanted to add that I'm happy your first pattern was the Blue Bamboo scarf. It's a favourite of mine, as you well know! Oh my you ladies are really doing a great job NOT buying up the place:) SWEET Apollo, happy that he is feeling better! Have a blessed day dear friend and enjoy your morning! HUGS! Very impressive that you came away with so little -- that's willpower! Be careful with that little mousie -- Apollo might get him. It sounds like you visited an amazing place! I'm so sorry your Apollo was ill! Our cats have been ill too but seem to be rocovering now. Congrats for being selected by Cut Out & Keep!! I'm going to pop over to their website now. I've avoided Stitches Midwest for years because I don't think I could exercise any self-control! Glad your kitty is feeling better. I was wondering whether you'd be interested in selling advertising space on goldenbirdknits.com? 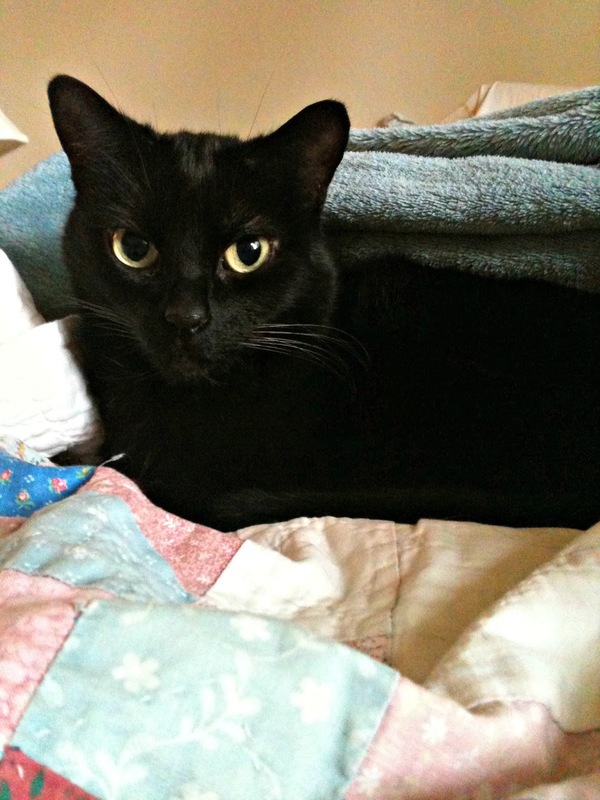 Your cat is very cute.